Tell us a little about your background. How did you get into law enforcement? My Dad was a FBI agent, which introduced me to the law enforcement arena. Graduating high school, I really didn’t know what I wanted to do. I went to Arizona State University to study computer engineering and switched to accounting and neither were really right for me. While in college I worked part-time with the ASU Police Department – initially in student patrol and then in dispatching. Here I found something I liked. When I was 21 years old I went to police academy and became an officer with the ASU police department. I started in undercover narcotics and then moved to street patrol. The street patrol bored me and I ended up leaving and joining the Scottsdale AZ PD. I stayed there for 19.5 years. When I left Scottsdale, I managed to land a Chief’s Job in Show Low. I stayed there for 5 years and it was great experience. 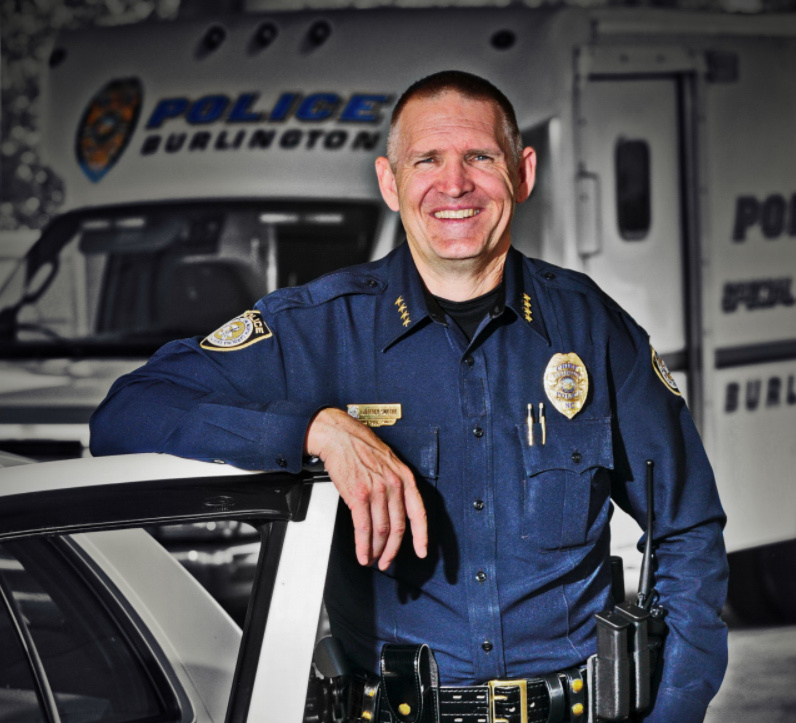 In the three years you’ve been the Chief in Burlington, you’ve earned a strong reputation as a Chief who strives for continuous improvement within your department. How did your Scottsdale experience lay the foundation for that? That foundation was actually set much earlier. My parents were both teachers. My Dad moved to the FBI later in his career. My parents instilled in me a value for life-long learning and continuous improvement. 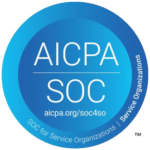 In Scottsdale, I was fortunate to work on the department policy manual and accreditation efforts. These experiences helped develop my executive skills. When I left Scottsdale I was a lieutenant and was responsible for the property crimes division. I had 5 sergeants in my division. What was your path from Scottsdale to Burlington? After Scottsdale I became Chief of Police in a small agency: Show Low, AZ. They had 33 sworn officers at the time. I was brought in to initiate change. The department was lead by the same chief for 20 years followed by another for 4-5 years. The second chief appeared to be retired-on-the-job and just “going through the motions” rather than truly leading the department forward. Moreover, his wife lived in another city so he was out of town a considerable amount. Over this 25 or so year period of time, the department became insulated and stagnant. I came in as the chief at Show Low and stayed there until my retirement from Arizona law enforcement 5 years later. During that time, I worked for a very strong city manager who taught me how to be a strong chief. We got the department accredited, established a fitness program, and moved the department towards best law enforcement practices. My wife has family in North Carolina, so it was a natural choice as a next step. When the Burlington position opened, I applied along with 60-70 other individuals. The city manager liked the fact that I was a sitting chief at the time, unlike the other applicants. He didn’t want to have to teach someone how to be a chief. I started in Burlington in 2013. When you went to Burlington, what was your assessment of the situation? What did you feel needed to be worked on within the department? Burlington was in a good position when I arrived. For example, they were accredited and had a low level of litigation. However, they also had only internal chiefs for 30 years and that, combined with an elimination of travel for training purposes during the economic downturn, resulted in an insulated, regimented department. When I first arrived and questioned certain practices, I frequently heard “this is how we’ve always done it” in response. My overall assessment was this was a good department but one which needed to move towards industry best practices. We had a lot of strong staff, but many didn’t realize there were better ways to achieve our goals as a department. What were some of the specific areas you focused on to drive improvement? One was around the four captains. It made sense to move some around to better capitalize on strengths and counter-balance weaknesses. Related to that, I felt they needed to work together in a better, more integrated way. To achieve this we started rotating captains. Now, three years later, most of the captains have rotated two times. These rotations have better enabled the captains to work together at the department goal level and not just focusing on their divisional needs. A second area of focus was fitness. Industry data tells us that fitness is important on many levels. I, myself, went through the FBI National Academy in 2011 and, to be honest, it was a life changing experience for me. Within that program, I learned a great deal about fitness, nutrition and ways to achieve overall wellness. In Burlington, we built a gym and set fitness standards. We instilled twice-a-year fitness tests. In North Carolina there is a mandatory fitness test for officers — the POPAT (Police Officer Physical Ability Test). However, that test is once and done for each officer – no recurring testing; no continuous improvement. It’s hard to overstate the importance and benefit of implementing our fitness program and testing. Actuarial tables tell us, historically, the average police officer died 7 years after retirement. That number is now down to 5 years as an average. The main culprits of early death are what you’d expect: heart disease, diabetes, stress factors, implications of poor eating habits. In Burlington we initiated the fitness program and instilled a 2-year grandfathering period prior to fitness testing to give the staff time to improve their fitness levels. Starting in 2014 we instilled mandatory testing for all new recruits. After that two-year practice period, we had a very high compliance rate at our first mandatory department fitness test: 90% of the staff passed on their first test; about 8% needed more work. Believe me, it wasn’t because the fitness test was easy. We had staff members who lost 125 pounds or more on our program. One staff member was pre-diabetic with his blood numbers all pointing the wrong direction and about to start taking 4 different drugs as a result. The officer lost 75 pounds and his blood work is perfect now. We have many inspirational success stories like this. While its too early to measure improvements in policing and initially, not surprisingly, we saw a slight uptick in minor injuries as a result of some sedentary people becoming much more active, there have been many, many benefits from the program. We have had a decrease in medical claims and have even caught some major health issues, like cancer, before they became beyond help. Our program resulted in an award from the Department of Justice for having an excellent, comprehensive wellness and fitness program for employees. So I have to ask, did anyone not make the cut and need to depart? We did have a small number who left to take other policing jobs – and that may have been driven partially, at least, by the fitness requirements. There have been other changes in the organization too that might have been cause for movement. They saw the writing on the wall and chose to leave. Nobody was fired as a result of the fitness requirements though. What other changes were a focus? One was the scheduling. The department was utilizing 12-hour shifts rotating days to nights over each 28 day cycle. All training was held on days off. I had an immediate concern around this scheduling. Again, when you look at industry medical data you realize there are big downsides to unsteady sleep patterns and other facets of this type of scheduling. There was strong internal resistance to changing the schedule however. I tasked an internal committee with creating a scheduling alternative which was healthy; included training on duty, avoided rotating schedules and reduced the 12 hour shifts and was flexible enough to match staffing to call load – something the prior scheduling algorithm didn’t do well. I’m glad to say the committee devised a schedule which achieves all the goals and everyone seems to like. The new schedule also resulted in recruiting benefits. Given your leadership experiences in both Arizona and North Carolina, what advice would you give up-and-coming Chiefs? One of the most important aspects to focus on is communication. Having a clear communication plan and instilling the importance of strong communication down the line is of critical importance. Everyone has filters and both the quantity and quality of communication tends to deteriorate as you move from the top to the bottom of an organization. I would suggest new chiefs find a good communications training class for department leadership to partake in. While its important to understand leadership and get the tactical aspects right, excellence in communications, especially the difficult conversations, is paramount. The “courageous conversations” – ones in which negative feedback is given and discussed – those are very important. Many people have the will but not the skill to initiate and conduct those communications in a productive way. It’s important to train the command staff on how to have those conversations in a good way, and then train other staff members down the line. You realize it’s so important for the accurate message to get to the receiver in a way that will lead to improvement. What does the future hold for your department? Where are you heading? We have a current focus on understanding bias and de-escalation training. We want to minimize the probability that force is required in confrontational situations: how to utilize time, distance and other factors to resolve situations in a calm manner. In the longer run, we want to strike the right balance between the “warrior” and the “guardian.” I believe this is an evolving struggle in policing generally. In the 80’s we saw a lot of community policing across America. In the 90’s there was a shift to more of a warrior mindset – always being ready to fight if need be. In the 2000’s again we are seeing a migration back to the community ways. We need to excel at marrying those two mindsets to enhance in the safety of our citizens. Ideally we are guardians but warriors if needed. This is a big challenge in policing. We also need to evolve our recruiting methods as the next generation of young people enters the workforce. We’ve seen changes from Gen-X to Gen-Y, then the Millenials and further changes will accommodate whatever group comes next. We need to find better ways to communicate with and motivate this younger generation. We see more concern for work-life balance and focus on family in the younger generation. We need to adapt as a result. Likewise, we need to ensure younger people – right down to children – see police as on their side and not as enemies. We have difficult hurdles in this area. We see some socio-economic segments of society basically teaching their children to hate police, on one hand, and wanting community policing, on the other hand. One way we are trying to close this widening gap is by being involved within the schools. By being present and engaged with the young people, we have a fighting chance to win their hearts and minds before the negative messages they are bombarded with in today’s music and other media results in a negative mindset. We have age appropriate programs at all levels. We color with the elementary aged children, play games with the slightly older ones and engage the high school students in ways which are meaningful and helpful to them. In doing this, we attempt to bridge that gap between the negative media messaging and who we really are. In a sense, the school programs are 15 year recruiting programs. Thank you so much for your time and insight today.